So excited to share this recipe for Gin Marinated Cajun Shrimp with Zucchini. I kid you not Dillon and me ate all of it in one sitting twice! This is a great summer "wear a bib and get your hands dirty" kinda dish. Spicy, tangy and herbaceous this hits the spot, on all levels. Okay, so I love simple gin and tonic or even a good Negroni when I'm in the mood, Gin is dfinitely my go-to spirit on a fun night out. I had the chance of trying Brockmans Gin recently and it has absolutely blown me away! They take great care in sourcing botanicals that are steeped in 100-year-old copper barrels. Wow. When we decided on a collaboration and they wanted me to create something savoury. I was more than happy to oblige because I had never cooked with Gin a recipe before and I am always up for a challenge. I realise there's so much more you can do with a good bottle of gin. You have probably read about the use of alcohol to deglaze fond off of pans after searing meat to make a delicious sauce and that's what I initially had in mind initially. But after doing some research I wanted to make a dish that was summery and used some sort of seafood. I like spending hours in the kitchen, but I know a lot of people don't so I tried to keep this recipe as simple as possible. Make the cajun spice a day or even weeks ahead to save trouble the day of. 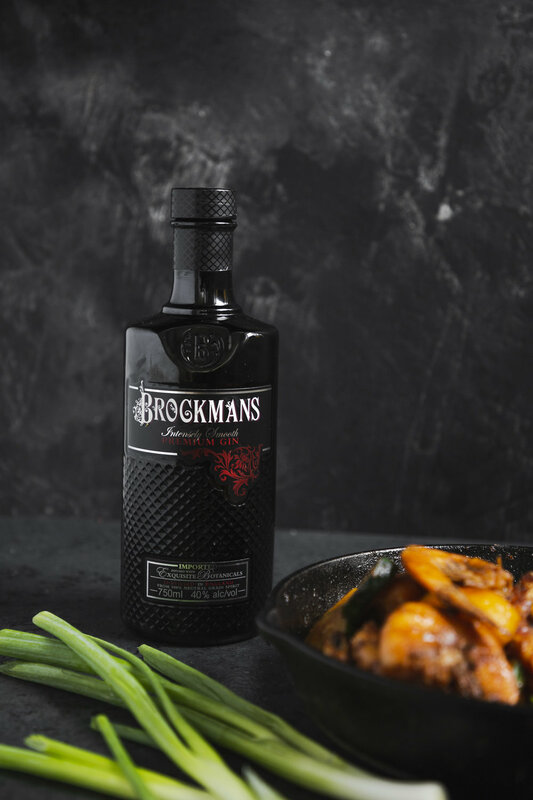 For the seafood, I went for shrimp because I knew it would compliment the all the amazing botanicals Brockmans uses to steep their Gin. You can choose to make this recipe with de-shelled shrimp, but I enjoy the act of peeling the shells and sucking out all the juicy goodness of the Cajun and gin marination. Messy but SO worth it! Marinade shrimp, zucchini and bell pepper with 3 tablespoons of cajun spice mix, gin and lime juice. Heat oil in a skillet and add the shrimp and veggies. Cook for about 3 mins on each side and serve hot with lime wedges.